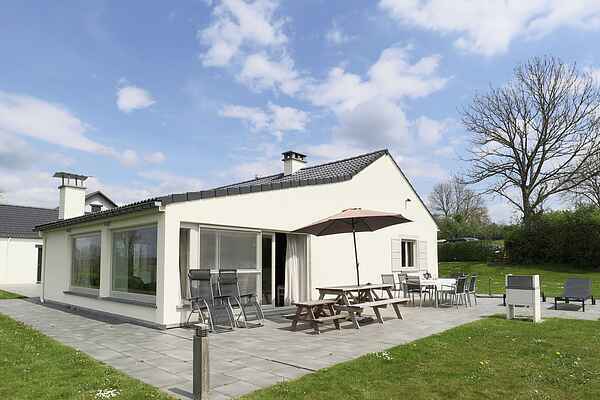 This holiday home is situated in a quiet location on the edge of the Rendeux municipality in the heart of the Ardennes region and offers a stunning view of the Ourthe valley. The holiday home, which is easily accessible for people with disabilities, has been neatly furnished. There is a fantastic view of the surroundings through the large windows in the living room. After a long walk or bike ride relax in the Finnish sauna after which you can use the big rain and massage shower. In the summertime enjoy your delicious breakfast on the patio and in the evening, light the barbecue. With stunning views and tranquility you'll experience the true Ardennes! Rendeux is an attractive village with a restaurant, supermarket and artisan shops. The region is hilly and offers more than 200 kilometres of great walking and cycling routes. Go canoeing on the river Ourthe which is only 5 kilometres away. You can find skiing and cross-country skiing opportunities in Baraque Fraiture (17 km). Durbuy, the smallest city in the world (19 km), and the picturesque town of La Roche en Ardenne (12 km) are most certainly worth a visit.